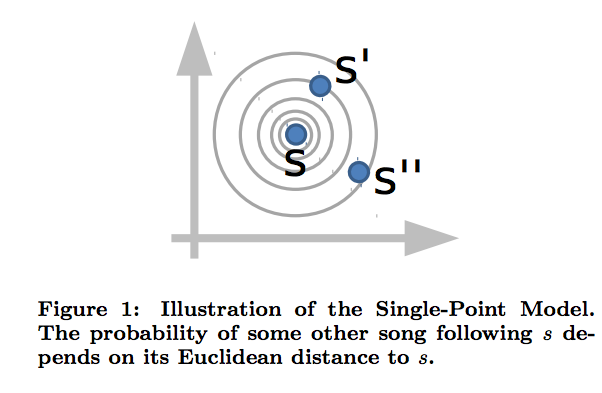 In this post, we are going to see how to build our own music recommender, using the Logistic Metric Embedding (LME) model developed by Joachims (of SVMLight fame). The core idea of this recommender is that people listen to songs in a specific sequence, and that certain songs sound better when they follow other songs. I first began working in sequence prediction in about 2001, where I developed the Effective Operator approach to Personalized Recommenders. This was a recommender system that used a kind of Bayesian / Regularized Linear Regression. Some years later, working with eBay, we researched the effectiveness of search relevance (a kind of sequential recommendation) using techniques including Joachims’ earlier work on Structural SVMs. Recent work has focussed on built upon the Structural SVMs for Ranking, leading to a new, simpler approach, Metric Learning to Rank. 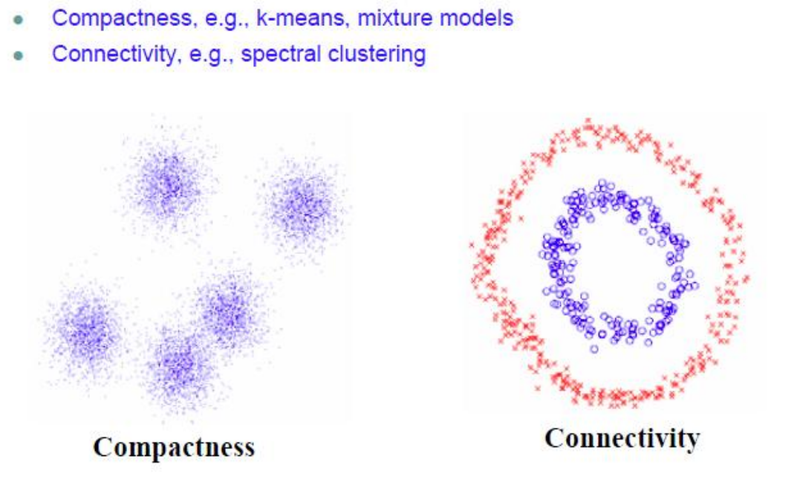 Metric Embedding is, in general, a good thing to know about, and you can learn about it more generally from the University of Chicago course: CMCS 39600: Theory of Metric Embeddings. Joachims has subsequently also considered metric learning, and here, we examine some his recent research in metric learning for sequence prediction. 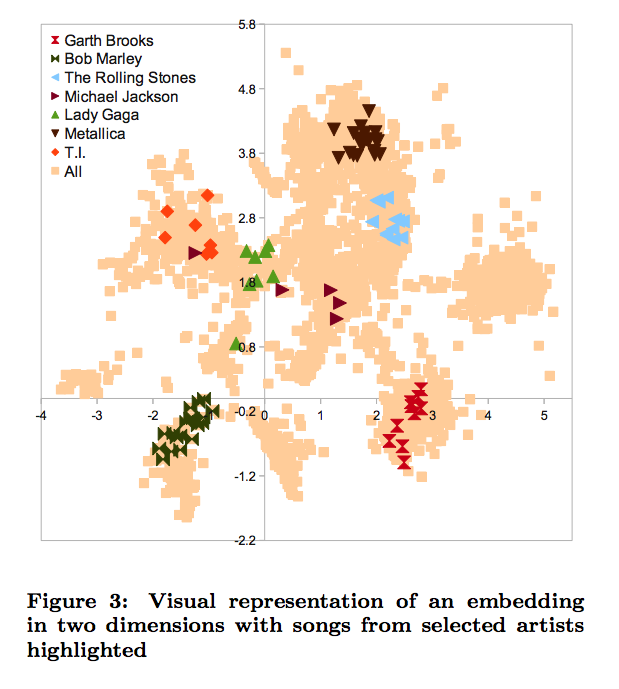 Specifically, we look in detail at the Logistic Metric Embedding (LME) model for predicting music playlists. We would like to recommend playlist of songs. More generally, we seek to estimate the probability of observing a new, directed sequence , given a training set of a very large set of directed sequences . To do this, we define a conditional, probabilistic, vector space model that retains the local sequence structure of the sample data, and we try to learn the optimal model via regularized maximum-likelihood estimation (MLE) . Because we have a Markov Model, we will see that all we need is to write down the local log-Likelihood, defined through the conditional transition probabilities , and, as usual, some regularization. Joachims ignores long range interactions and only regularize locally, and I will note some opportunities to address this. Also, we note that assuming a Markov Model is actually restrictive (Recall our post on Brownian motion and memory effects in chemical physics) . First, it assumes that to predict the next song, the only songs that matter are the ones we listened to before this song. Additionally, Markov Models can ignore long-range interdependencies. A NMF based recommender does not assume this, and they include long-range effects. Recent work (2013) shows how to parallelize the method on distributed memory architectures, although we will do all of our work on a shared memory architecture. they even provide sample code! Joachims introduces 2 different models, called the Single Point and Dual Point models. We should only care about the Dual Point model, although, curiously, in the published paper (2012), the Dual Point model does not work better than the Single Point model. So, for now, we describe both. Also, the code contains both models. 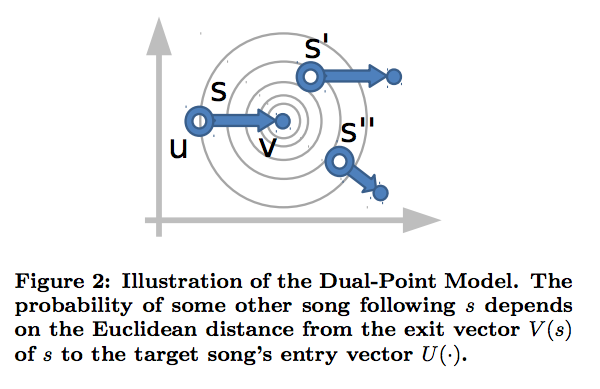 By a Metric Embedding, we mean that the conditional probability is is defined with the metric, or distance , in the Latent space where we have embedded our states (songs). Notice Joachims writes and to distinguish between vectors associated with elements of a playlist and arbitrary elements of . In a model for , say, playlists, each vector it is , initially, just a point on a -dimensional hypercube. We then run an inference algorithm which learns the optimal vectors that minimize the total regularized log-likelihood , as computed over the entire training data, and subject to the specific model chosen. This is just a standard Vector Space model. In the Dual Point model, however, we associate 2 points (vectors) , with each state within a sequence . We call these the entry and exit points. (In mathematical physics, the embedding is a called a Vector Field or, more generally, a Fiber Bundle ). The Latent metric is the Euclidean distance between the end point of and the starting point of within a directed sequence . We can also construct sequence-independent ( ) vectors by simple averaging over a large sample of known sequences (i.e. song playlists). This is just the normalization of the conditional probability (above). Note that the sum is over all possible states , and for numerical performance, we will restrict the sum to nearby states. Actually, the final model used is somewhat more complicated because it includes other features to adjust for popularity, user bias, diversity, etc. The optimal solution is found by maximizing the log-Likelihood , subject to regularization to avoid over-training. in this related post, I explain the partition function and where it comes from. and ensures that the entry and exit vectors don’t get too large. It is similar to the kind seen in traditional matrix factorization techniques. In a simple Netlfix-style item recommender, we would simply apply some form of matrix factorization (i.e NMF) to directly, and ignore the sequence structure. Here, it is noted that we have some flexibility in computing , and we could both Kernalize and Regularize it before running the inference algorithm. Now that we have a basic review of the model, it would be fun to make some personalized playlists. This can be done using the online LME Software. Have fun exploring! Next Post: Foundations: The Partition Function. > In our next post, we will look in detail at the LME Software and build some actuals playlists. Looks like that won’t happen. Actually LME code is a mess. The fact that you can compile it with simple make is nice, but code is very hard to read. Frequently academic code needs to be cleaned up. Turns out the guy I was working this with decided to switch gears and do something else. so are there any actual plugins that use this ? actual usable code ? Joachims released code. It’s not pretty.